Tomato potato psyllid (Bactericera cockerelli) is a tiny sap-sucking insect which feeds on tomato, potato, capsicum, chilli, goji berry, tamarillo, eggplant and sweet potato. The weeds nightshade, groundcherry and field bindweed are also hosts of the insect pest. TPP is a significant pest which can affect plant growth, reduce crop yield and spread a serious plant disease known as 'zebra chip' in potato, caused by the Candidatus Liberibacter solanacearum (CLso) bacterium. CLso has not been detected in Western Australia. Tomato potato psyllid, Bactericera cockerelli, comparison with five cent coin. TPP has three stages of development – egg, nymph and adult. All stages are very small (less than 3mm) but can be seen with the naked eye. Adults and nymphs cause injury to plants when feeding. Adults resemble small winged cicadas in appearance, but are the size of an aphid (about 3mm long). The body is brownish and has white or yellowish markings, and a broad white band on the abdomen. Wings are transparent and rest roof-like over the body. Nymphs are up to 2mm long, oval shaped and have a flattened scale-like appearance. Young nymphs are yellow with a pair of red eyes. Older nymphs are greenish, fringed with hairs and have visible wing buds. Eggs are less than 1mm long and attached to the plant by a short vertical stalk. They are usually laid on the lower surface of leaves or as a halo around the leaf edge. Eggs are white when first laid then turn yellow to orange after a few hours. TPP can carry the CLso bacterium, associated with 'zebra chip' disease in potatoes. Commercial and residential growers of host crops should regularly check for signs of TPP. Check for the tomato potato pysllid on the underside of leaves. The more mature adults are darker in colour. Nymphs are 2 mm long, oval shaped, flattened and scale-like in appearance. Psyllid eggs are less than 1 mm long and are white when first laid, then turn yellow to orange after a few hours. Check for the tomato potato pysllid on the underside of the leaf. 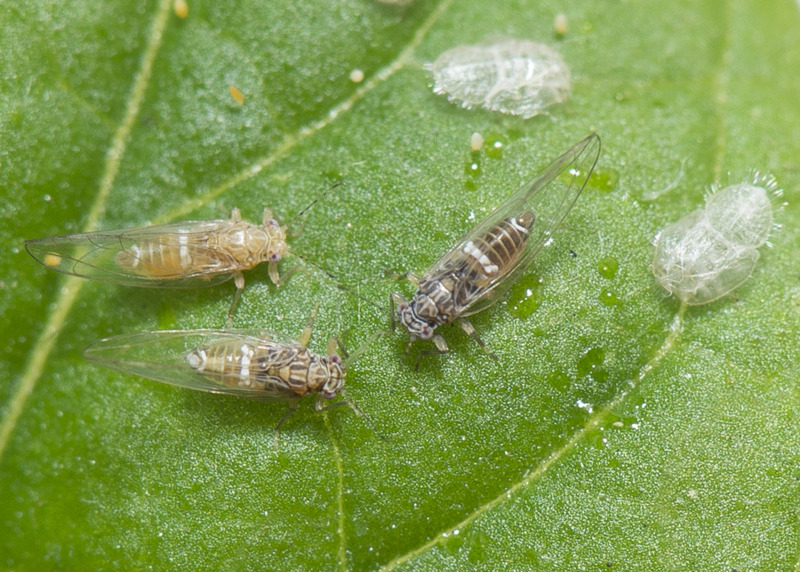 Symptoms of Tomato potato psyllid infestation include yellowing of leaf margins and upward curling of the leaves. Commercial vegetable growers and home gardeners should check for signs of TPP and report anything unusual to the Department of Primary Industries and Regional Development.